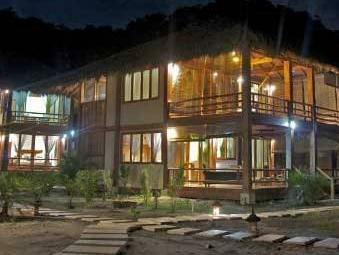 ﻿ Best Price on Pranamar Villas & Yoga Retreat in Santa Teresa + Reviews! Offering a peaceful setting on Playa Santa Teresa Beach, Pranamar Villas & Yoga Retreat features villas overlooking its swimming pool and lush, tropical gardens. It offers terraces with views of the Pacific Ocean. The luxurious, spacious villas at Pranamar Villas & Yoga Retreat feature terraces with hammocks. They all have Indonesian-style décor with attractive bamboo furnishings, and open-air bathrooms with granite sinks and bathtubs. There is a fan, free Wi-Fi and a fridge. Beachfront villas also have a kitchen and a seating area. The Pranamar’s open-air restaurant serves healthy, organic dishes with Asian and Pacific influences. There is also a tea lounge. Playa del Carmen, Malpais and Moctezuma beaches are within 6.2 mi of the hotel. Cabo Blanco Nature Reserve is a 10-minute drive away.